The Airis Switch Vape is an innovative vaporizer made for dry blends that can be quickly converted to support concentrated oils using included bullet chamber inserts. For dry blends it uses a top quality ceramic heating oven that ramps up quickly, delivers robust flavors and is 100% food safe. Airistech also includes a stainless steel bullet insert option for dry that can help streamline session on the go. When you're planning to go out for the day, pre-pack your extra bullet so when you've finished up with your first session you can just drop it in and quickly get back to vaping without the hassle of refilling. If the occasion calls for thick concentrates oils then Airistech has you covered with two chamber bullets that will accommodate your needs. Remove the top cap, fill your oils up to the max line and replace the cap and place it into the Switch's chamber. 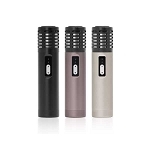 The Switch Vaporizer has three integrated temperature control settings that are optimized for multi-use. Whether it's dry blends or thick concentrates you have a setting that will help you to achieve peak results. To adjust it's temperature level first power on the device by quickly pressing it's button five times. You will notice the LED flashing, this indicates the device is heating. It shows one of three colors to signify it's temperature output (Green 420°, Blue 435°F, White 450°F). When you've hit the setting you're looking for, release the button and allow the Switch to continue heating. 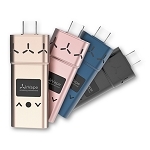 After about 30 seconds the light changes to a solid color and entire device will vibrate to notify you it is ready for use. Give it another 3-4 seconds and then you're good to begin inhaling from the innovative 360° rotating mouthpiece system. After 3 minutes of continuous use the Switch automatically powers off to prevent damage. Reactivate the element with 5 more clicks to continue heating your material as needed until finished. 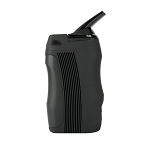 Under the hood the Switch Portable Vaporizer has a top shelf lithium-ion battery with 2200mAh capacity. 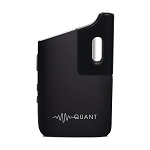 This will keep you going all day long and when the time to recharge eventually comes it fully charges in 2-3 hours with a supported passthrough option for those that simply cannot wait. Just remove the bottom silicone cap, attach your charger, the LED will power on to show it's charge and power off when finished. Grab the Airistech Switch Multi Use Vaporizer today in four sleek color options with a long list of tools, accessories and spare parts to keep you going for plenty of time to come. 6 points worth $6 will be earned when you buy this item.